Lately I have not been inspired. So one random day I decided why not start reading books. Of course going out and exploring is a way but I am trying a different approach. It is still early to tell but I really am enjoying it. I might be a little late but I’m currently reading Grace: Memoir by Grace Coddington. I have wanted to read her book since it was released but never got around to it. Her illustrations are quirky and she is so witty. I was able to get more books since I’m on the quest to grow my collection. Being a huge fan of M.I.A and Pharrell, it was time get their books. They are such icons and walk to the beat of their own drum. 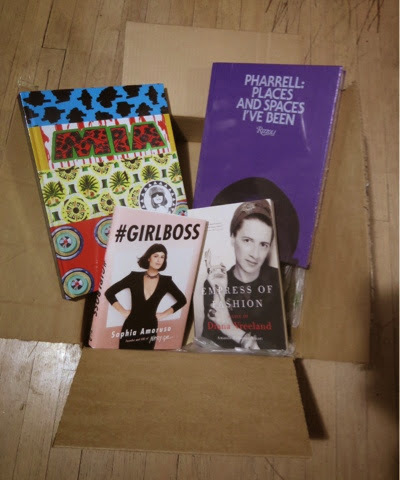 #GIRLBOSS is another additional and have been seeing many read it. I am eager to read it next, as Sophia is showing how business can be done in this day in age. Lastly, Diane Vreeland has been an inspiration after watching her documentary on Netflix. She was a character and wanted to read more into her life. If any of you have read the following books and tell me what you think. Let me know if you have any suggestions too!